Fu Dogs – Temple Lions placement for your home or office. Fu Dogs are an extremely powerful protection for your home or business; you will find most homes or business in Asia complemented by a pair either inside or outside. 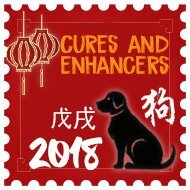 Out of all the cures and enhancers in Feng Shui, Fu Dogs in our opinion are the most essential. They come in all shapes and sizes and some of the homes I have visited all over the world display some of the most magnificent pairs I have seen especially the ones in Asia. Probably the most impressive are from the Beijing’s Forbidden City as shown below, these are really amazing to see. 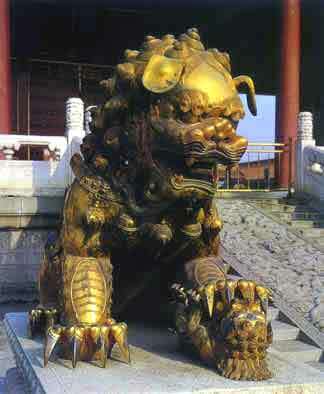 They are also know as guardian Lions, lion dogs, or temple lions. We consult on hundreds of homes and business each year and around 70% will have Fu Dogs either placed by the door or windowsills, I would also say that 50% are placed in the wrong order, check below for confirmation. 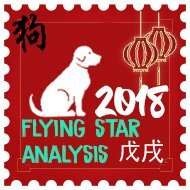 Where do I place Fu Dogs in 2018? 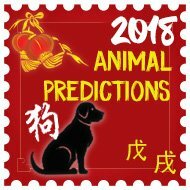 For protection in 2018 you should place a pair of Fu Dogs – temple Lions in the southeast if they are red coloured or in the north if they are made from metal, especially if you have a main door in either of these locations. As with all Feng Shui cures and enhancers you should make sure you cleanse all your symbolic ornaments. We cleanse all ours every 3-4 months by washing them and then placing them outside in a full moon or direct sunlight for at least 2-3 hours. By doing this you cleanse them of negative energy and empower them with positive Sheng qi energy. You will find many variations on web sites, some will have a ball under one paw others will have a Cub under another paw, the most important thing to remember is the order placement and not which foot the ball or cub is under. The male lion, holding a ball under his left or right paw should be placed on the left side (as you are looking out of a door or window). The female lion, holding a cub under her right or left paw is placed on the right side. Fu Dog (Female) at Beijing’s Forbidden City (a nice sunny day) This magnificent bronze Fu dog is one of six pairs scattered throughout the Forbidden City. Temple Lions with plain balls under feet. These are a magnificent pair on a plinth available here. Fu Dogs with plain balls under feet. These are very common and popular as mistakes cannot be made with placement. hi. where could i send email? You can send an email to jo@fengshuiweb.co.uk or use the ask a question tab on the side of the website. Hello, I have a male(w/ball) and female (w/cub) statue foo dogs on its own platform. They are brownish gray looking when I ordered said brown. My question: I am wanting to put foo dogs outside my front garage door (facing south) on each side (Of the main garage door). We have such a small front door entry No room for foo dogs). Can this be done? Or should I place them on each side of the sliding backdoor outside (facing North)? Note: I have two male dogs in front of my lamps in the house in front of a window as decoration facing North into my kitchen, where the back sliding doors for backyard, I originally bought them-the store did not have a female, hence the reason why I have two male in the house. I would place the Fu Dogs either side of the garage door. You could also place them on the inside of your front door, looking out. I recently bought a pair of used marble Foo dog from facebook marketplace. I have placed it in front door entrance facing south. Just wondering it’s coincidence or it bring bad omen. My jade bracelet broke then after my father in law passed away, follows by my greatfather in law. All happened within a week. I wonder if I should give it away. I’m sorry for your loss of your father in law. I would suggest cleansing the cures before placing them as they can hold a lot of negative energy if they are used. 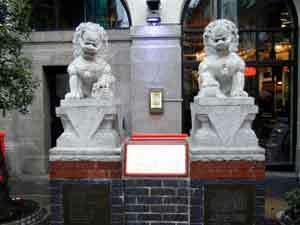 Im planing to buy pair lucky foo dogs medium size to put outside main gate. Please advice. Thanks! You are better off buying them from a garden centre or similar and make sure you follow the advice on this page for placement, male and female etc. Also make sure they are not too big or small and better as you said to a medium size. Incase if I buy fu dogs …. can I place it inside the house rather than the outside… in the main room which is facing directly towards the entrance ..north side …main door of the house. The Fu Dogs will be fine if placed inside. I would have them facing to the outside of the home. I had a nice pair of small ceramic foo dogs that i kept in my kitchen for good luck (near a main door where people enter). A person working in my house broke one and tried to glue it together and it’s terribly ruined, can’t sit anymore. How do I “dispose” of them without offending spirits or tradition? Sorry to hear about your Fu dogs. I would dispose of them by wrapping them in cloth or tissue and carefully place them in a bin outside of your home. They can help, yes. I would recommend putting a ba gua mirror outside, facing your neighbours home. Hi! I bought the fu dogs pair recently…it is gold in color (not metal, not sure what it is made of) and about 9inches in height…I am not sure where I can place it for maximum benefit…please can you help? I would place these outside your front door for protection. If you were starting towards your front door, you would have the Fu Dog with the ball on the right side looking out and the Fu Dog with the cub on the left side. Hello! I just bought a large, male foo dog at the garden store (he’s got a ball under his right foot). I now realize I need to go back and purchase the female – however, I do not see anything under either of her feet. There are no other foo dog varieties aside from these two, so I am assuming that this one is, in fact, the mate of the one I purchased. Can this be correct, or will the female always have a cub? I do have photos if that would be of assistance to you. These will go in our back garden. Thank you very much for your help! If you could send the photos to jo@fengshuiweb.co.uk and put the subject as FAO:Daniel. I will be able to advise you better once I’ve seen them. You can place them both on their own although they will not be as effective and is better placed in pairs to complete the energy. I would place one by the front door and one by the back door. Is it normal for the male to have the ball under his left paw and the female to have the cub under her right paw? You could place these in the window, looking outwards if you like. I have two red fu dogs, my porch is in the south east corner of my house. However the door into the house is on one side, the porch extends sideways. Do I need to put them either side of the front door or can I put them either side of the window next to the door? And would I put them in front or behind my rubber plant? It’s hard to visualise but I would have the Fu Dog’s facing on to the main entrance of your home looking out to the busiest part. This can be in a window looking out or by your front door. I would recommend painting them a brown, burgundy colour or you could also paint them a gold colour if you prefer. My husband just found a 3ft grayish resin female lion disposed of froma yard sale I think. Has a small crack In The side. Other than that itsta da in a pedestal and is lovely. He automatically put In the southeast corner of our back yard. Is this good or where can we place to increase prosperity? Thank you for your asisitance. I would recommend filling the crack if possible. This will be fine there as long as it is not looking towards the home. hai, I have two Fu Dogs, they are small, butI think made from wood. One hase the ballunder the right feet the other under the left foot. My front door is in the north, my outside windor is in the back on the south.How do I position the outside in the North or or facing the south. and do I have the balls inside the pair or outside the pair. I would place the Fu Dogs outside your front door in the north looking outwards. You should have the balls inside closest to the door. What side do they sit on? does not say what side to place them on left or right ? The ball or cub should sit on the inside closest to the door. I have 2 gold fu dogs my front door is west, should I buy a different colour pair for west door? These would be great in the west as this will weaken the negative #2 star. I have a pair of porcelain colourful foo dogs. Too precious and breakable to put outside. My question is where to best place these in my house. Our front door faces east. I have a shelf inside on the south side of the door that they can go on. I can also put them on a small table in the entryway facing out. The table will be about 6 feet from the front door if that is a consideration. I also have an upstairs window that faces east that I can put them on. What is your recommendation? Would anyof these work? Is one location better than the other? We have neighbours that we need to counteract the negativity from their home. They live on the south side of us. I would place them in the inside of your front door facing outwards if possible on a small table. They are usually best placed by the front door looking out so if you cannot put them outside, inside looking out is the next best option. This all comes down to personal choice if you want to keep it or not although I would personally dispose of it unless it has sentimental meaning. If my child had done that, I’d have taken him back to the garden to return the ball and apologize for stealing. I guess nobody believes in teaching kids right from wrong anymore. Regardless of sentimental value, a stolen object would have negative energy. I have a pair of green faux jade Fu dogs. I live in an apartment on the 3rd floor (of 6)t. The building entrance is facing North, and my apartment entrance also faces north. They frown upon placing any objects outside doorways, so I’d like to place them inside my apartment. What is the most beneficial way to place my male and female fu dogs inside my apartment, and how do I position them, facing out or in? You can place them on the inside of your door facing out of your apartment. I have brass Fu Dogs and my main entrance location is south. Can I place them on my top cupboard which is West facing South? That’s the closest to the door entrance? Or for this year it has to be north facing north? I have already a lot of cures placed in the north so I was wondering where else can I put them and which direction should they face? Many thanks. These would be great in the west, facing towards the south as this will help weaken the annual #2 located here. Can I place it in the porch, looking towards south east? As on the entry they are on the left side of the entrance in the porch. Could you please send a picture in a private message or on the wall on our facebook page so I can give accurate advice on this picture? If you get a tattoo of fu dogs on your back. Would female be facing left side of back or right side? it’s based on where you are facing right? Or is it based on where the building/structure/body is. If I look at your back. Female Fu dug is on your left shoulder blade. Male on Right shoulder blade. Correct? Or would it be vice versa because you are facing forward therefore the female should be on your right shoulder blade and male on the left. ?? If I was standing behind you, looking towards your back, you would have the female on the left and the male on the right looking towards me. I live in an appartment n my main door is on west ..Can i use poster of male and female fu dogs on either side of the main door (Outside Since my kids plays around that area often ).And if so then about what height should i keep the poster. It would be better to use real Fu Dogs although you could try using a poster. Please let me know the results! I would keep the poster low to the ground. Hi apparently I have a beautiful orange male fu dog with jewels on it sitting on my dressing table . I was unaware it is a fu dog until one of my mother”s friend told her yesterday. The dressing table it is on is facing the doorway of the bedroom. Should I remove it from the bedroom? If so, can I place it outside the bedroom door? Otherwise shall I place it on the left hand side of my entrance on the inside as I already have four fu doors guarding the entrance on the front porch. This will be better placed outside the porch. I have a male fu dog statue that I have on my dressing table in my bedroom facing the doorway. Should I remove it? Is it bad luck to have it in the bedroom? Can I place it outside the bedroom door? You can place it on its own although it will not be as effective and is better placed in pairs to complete the energy. Hi, yes ideally they are better in pairs. You should place the Fu Dog’s with the balls on the inside of the door (left fu dog – ball on right, right fu dog – ball on left when looking out of your front door). I hope this helps, Jennifer. I have two fu dogs, but one is a white jade and the other is a light green jade. I made the mistake of not realizing that I should probably have two of the same color and I was financially strapped at the time. I remember the seller mentioned something about pairs, but I asked if I could get one of each because of the different jade colors and they said yes. There were other colors of jade, but I only opted for those two. I bought these when I was traveling several years ago. I am not sure if I have a male and female, but neither have a cub or ball underneath. Each has either the left or right paw stretched out. I have photos of the two at different angles. Please let me know the best way to upload or send the files. 1) Should I still display them or keep them in the box? 2) Which one is the male and the female? 3) We have a bit of a short wall separation between our main entrance and the living area upon entering the house. The fu dogs are too small to place outside of our door. A) Could I place it on the floor inside to either side of the respective door facing out? B) Or should I place it on that short wall, which is almost parallel to the door and make sure it lines up with one on each side of the length of the door? C) Or can I place them next to each other on the wall facing the door outward, which means when people enter, they will see them sitting together in the middle of the wall almost. D) I do have a wall opening that is a bit further, that is in the same line of the sight as the main entrance and the short wall, then this wall opening, kind of diagonal when lined up, would it be okay to put it there too? It would still be facing outwards towards the door. If you could send me pictures of the Fu Dogs over to our Facebook page in a private message, I will be able to answer your questions there for you once I’ve seen what they look like. I bought an ancient Foo dog made of clay fiber and brown rustic colour. Can I put in at the front entrance facing north. Can you please advise. Thank you in advance and looking forward for you reply. I would place the Fu Dog at your front entrance as long as you make sure they are on the right side of the entrance (male or female). Thank you for prompt reply. I have male and female. Can I put male on left side of the door when looking from inside house and female on right when looking from inside the house. I have pair of foo Dogs, but the female pair is broken please advice me how can I dispose them. Can I wrap in paper and put it in recycle bin. I would dispose of them exactly as you suggested and wrap them in paper and then place in the bin. I have very strong winds going through both of the balconies in my high-floor apartment. Since moving here few months ago, I feel like my ‘good luck’ had been blown away. I am wondering if I can place a pair of fu dogs at the balconies to ‘protect my luck’? If so, how should I do it? Would it be at the entrance to the balcony or perhaps at the extreme ends of the balcony itself? By the way, one balcony is at the eastern part of the home, the other is at the western side. Can I place the fu dogs at both balconies? I would recommend placing the Fu Dogs outside both doors on either side as shown in the photos on this page if you have them. I have only one fu dog-didnt realize they should be displayed in pairs. How should I dispose of it? I have a pair of large outdoor Fu Lions I inherited from my parents. They are green ceramic, probably from Thailand, Cambodia or Vietnam. I have a small space to the left of my front door (looking outward) where I put the male. However there is NO space to put the female. I do have space on the back patio on the right side of the door (looking out) where she can go. This would be proper placement of both but NOT together. Can I separate the two? Would this unbalance the energy/ feng shui? Also, doors face West and East respectively. So if they can’t be separated is one entrance better than the other? Fu Dogs are always better placed in pairs if possible. If you have room in the inside of your front door, you can place them facing towards the outside of the house. If you do not have space by the front door, I would recommend placing them by the back door. I hope this helps, Karla. 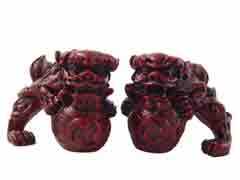 I have 2 small about 6″ high, dark red Foo Dogs. Can I place them in the window on the 2nd floor above the main door, (east side of house)? I don’t want to put them outside on the porch or inside on the floor by door, because I’m afraid they will be stepped on. I also have a large bay window near the main door on the 1st floor. Which window would be better to place them in? Thank you! This will be fine to place the Fu Dogs in the window. They would be best placed whichever windows looks out towards the entrance of your home. You can also place them on the inside of your front door if you prefer, facing outwards. I have both males, is this ok? I always thought one should be female and male? Fu Dogs should be displayed as male and female although if you have two males, you can display them on their own. hi i bought pair of fu lions and placed facing main entrance but getting confused that when i look towards them then where will be the female my left or right can u plz help. When you are facing towards the main door, you should have the female on the left looking towards you with the cub under her foot. We have an old house and bathroom is positioned facing the end of the stairs. Can we put the two foo dogs at the end of the stairs to counter this? You can place Fu Dogs here although I would just be sure to keep the bathroom door closed when not in use. Could you post a picture to our facebook wall or private message as I would not want to give you the wrong advice. I have a pair of 5 1/2 inch high marble Fu Dogs (no resemblance to lions) that were my father’s when he was with the British Army in Hong Kong around 1903. There does not seem to be distinction between a male or female. Also a small bronze incense burner with on the top cover a crude lion with both paws on a ball. These dogs are too small to be placed by the front door. How would you recommend they are best placed (Feng Shui) within our home? Hi I have a blue set very small so they have to sit on my front counter of our business do they need to be side by side or spaced out. How do I know left or right side. I’m afraid I cannot see the image. Could you please try sending it on our Facebook page. I would recommend disposing of both the broken and intact Fu Dogs and would not worry about the negative energy from damaging them. I have 2 white porcelain fu dogs. Can I place by my front door which is located south? Also, should i place them by the door or the entrance on the porch leading to the front door? The Fu Dogs will be well placed in the south of your home and can be placed either inside the porch or outside facing away from the door for protection; whichever you prefer. My boyfriend has what looks like 2 fu dogs but they are a jade color but don’t have anything under their feet. Do I still put them in my windows to the left and right of my front door? They are similar to the one in the link I’ll attach but on a wooden pedestal. Hi, I have e-mailed regarding my 3 fu dogs I found in my attic. It’s made of porcelain and one dog having both paws in a ball. Where shall I place them? You can place your Fu Dogs eitherside of your front door facing outwards either inside or out. Hi. Im living in an apartment. I dont want to display my fudogs images outside my dog. Cani place it inside? What will be its orientation then? Thanks. Yes, the Fu Dogs will be fine indoors. You need to have the female lion, holding a cub under her right or left paw is placed on the right side. Since it will be place indoor but still need to face the door facing outside, correct? Yes, the Fu Dogs should face the outside. 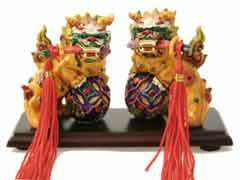 Just purchased a pair of red/brown coloured jade Fu Lions. Was advised by the seller that this is the youngest son of the Dragon. Have no ball or cub under their paws. One having the right paw in front and the other left paw front. (With me facing them) Both with mouths open. Can you please advise, how do I tell which is male and female. Is it ok to place them about 3 feet apart with other items in between. Have been advised to place this pair facing the front door to invite good luck coming in and repel bad luck. Is this the case. Looking forward to your feedback and thanking you in advance. Could you please post an image and send me the link so I can make sure I give your the right advice. I use the website https://postimage.org/ to post one off pictures. Have not use this program before. Upload 2imges. 20170104_134101 and20170104_134120. Hope I have done it correctly. Have already emailed you the images. 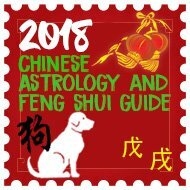 The correct placement for Fu Dogs is to have the female lion, holding a cub under her right or left paw is placed on the right side. I would like to have my lions in the back yard. Where do you like I should place them? Facing which direction? Place the Lions so they face the rear aspect, good protection to have here too. Michael, I’m just starting my research, but great comments, thank you. Have a weird question for you. I want to get fu dogs tattooed on both sides of my chest. I have peonies and chrysanthemums on my left arm and am doing more masculine on my right. Traditionally, I’d now have to get the male with the flowers and the female with the masculine side. Trying to nail the culture and tradition down right. Any issues with the above, or does it even matter mixing male with female elements, female with masculine elements? Really want to get this right as I’m adopting Some eastern culture into my life. Yes, i would place the Fu Dogs side by side, this will be fine. Can I place a poster of fu dogs couple above the front door? And, is placing small statues of them on the top of the pillars of the main door(outer most, after which the road begins) correct? The poster and small statues are fine to place. Thank you for the reply,I\’m assuming that if I get a female foo dog it would be placed on the left side since the male is on the right. Yes that is right, the easiest way to spot the female is that they will have the cub under their foot. If the Fu Dog is inside the home, it should be on the right side facing outwards. 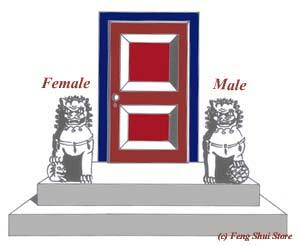 The male Fu Dog should always be placed on the right side of a door. I would recommend placing them on the windowsill, facing out of the window to the outside of your home for protection. Can you have too many fu dogs around the house? I would not recommend having them all over the house but they will be fine by all entrances and exits of the home. out the very best layout!) and wondering about this. I can\’t place my Fu Dogs outside for fear that they may be stolen or accidentally broken. They are too large for the windowsill, yet are too small and wouldn\’t be proportionate for my front door. I would prefer to keep them in the house. Please let me know where they can be placed on my living room. Thank you for your input and help! I have 2 Fu Dogs that are blue and made of stone, and were given to me as gifts years ago. One has it\’s mouth open, the other does not. They do not have anything under their paws. I have the Fu Dog with it\’s mouth closed in my son\’s bedroom, and I have the other with it\’s mouth open on a shelf in an open area between my kitchen and living room, facing toward my front door and window. I put them like this today because all the negative energy would go out of the mouth and out of the door (I had them in reverse order prior to today, and wanted protection on both floors and especially my son\’s room).A Is this correct? I cannot place them in a pair on the windowsill, as there is no room. Any suggestion that you have would be greatly appreciated. Thank you. I would recommend placing them together outside your front door as they will work in synergy when placed together. The correct placement is displayed on this page. I have 2 Fu Dogs that are blue and made of stone. They were given to me as a gift many years ago and none of them have a ball or cub under their paw. The only difference between these 2 is that one\’s mouth is open and the other one\’s closed. I have the one with the mouth closed in my son\’s bedroom, pointing towards the door, and I have the other one (mouth open) on a shelf between the kitchen and living room, facing towards the window and door. Then my sister told me that I should switch them, because she heard that the negative energy would go out of the mouth towards the door. Is this correct? I know that they should go on a windowsill, but they can\’t fit. Any suggestions or help would be appreciated. Thank you! Is it suitable to place the dogs in a window? My living room window faces a church and I would like to balance the energy, but it is in the south of the house. It would be fine to place them on a windowsill and is recommended. They should always be in pairs, Male (supremacy) female (nurture) often the male is used solo for power. There needs to be a balance. Mostly in western culture are they referred to as dogs, they are lions. The are a beautiful creatures and have an aura about them that cant be denied. I placed my Fu dogs on my window looking out male left and female right is that right??? Apologies for the late reply. That is correct, yes. I have only one. Can I use it to protect from malevolent energy of a spiral staircase?